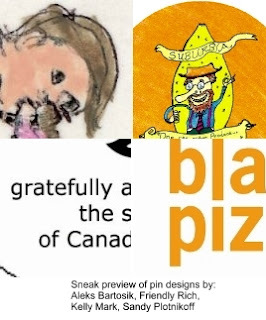 The Art Gallery of Mississauga has produced limited edition 1.5 inch pins, designed by four artists. One design will be available FREE at each of the events listed below! This is a sneak preview only. To see the entire design and get your pin, come out to any of the following events! To collect all four, attend all events. Focusing on the entire process of screen-printing, the demonstrations will cover every aspect of the print-making process from drawing the initial designs to the finished product. Do it yourself and join the exciting assembly line of poster art production. An exhibition of Jesjit Gill’s recent work and pieces resulting in the collaborative efforts of the participants from the Square One Youth Centre will be on display in the gallery space from July 19 – September 9. The Film Fort collective will transform the Civic Centre into a series of large child-like theatres. Creating the sense of wonder and nostalgia of home-movies and family slide shows each fort will house a different video programme. Prepare for a cozy night in - out. DIY screen-printing - This week!